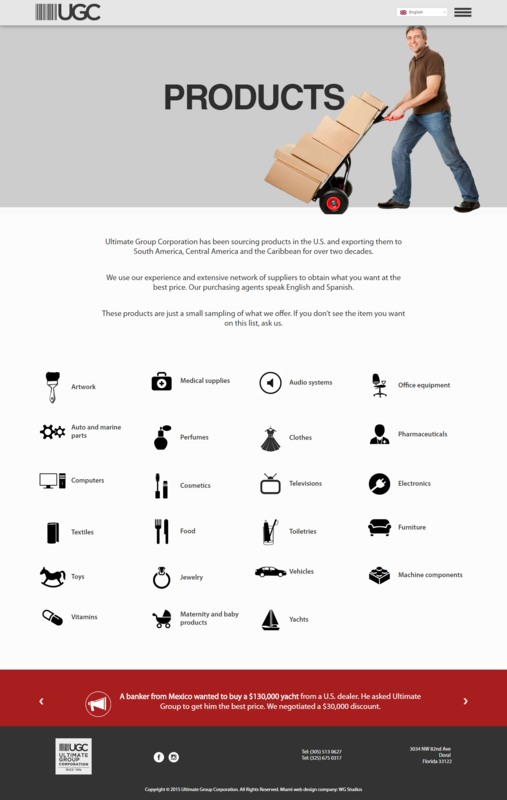 Based in Miami, Florida, Ultimate Group Corporation (UGC) is an import-export company. 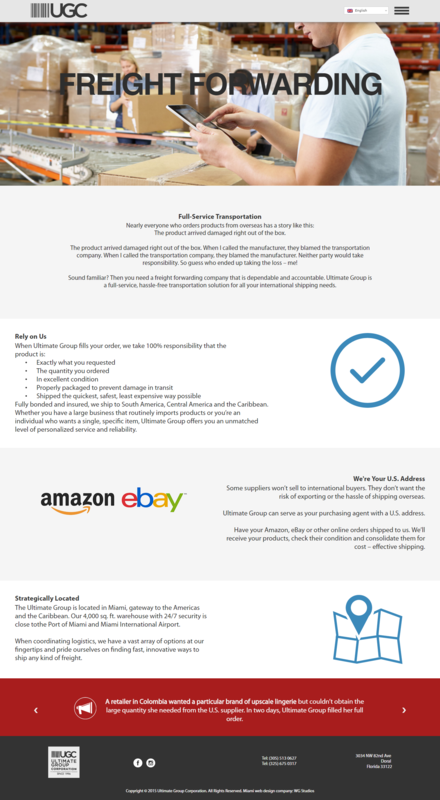 It offers product sourcing and freight forwarding services to businesses in South and Central America. Ultimate Group Corporation was founded in 2006. In its first decade of business, it had done almost no marketing. It had thrived, relying only word-of-mouth referrals and repeat customers. The import-export company was known to businesses throughout South and Central America as the best resource for obtaining products that couldn’t be found in their own countries. Ultimate Group Corporation sourced products such as name-brand televisions, computers, vehicles, construction supplies, machine parts, clothing and more. 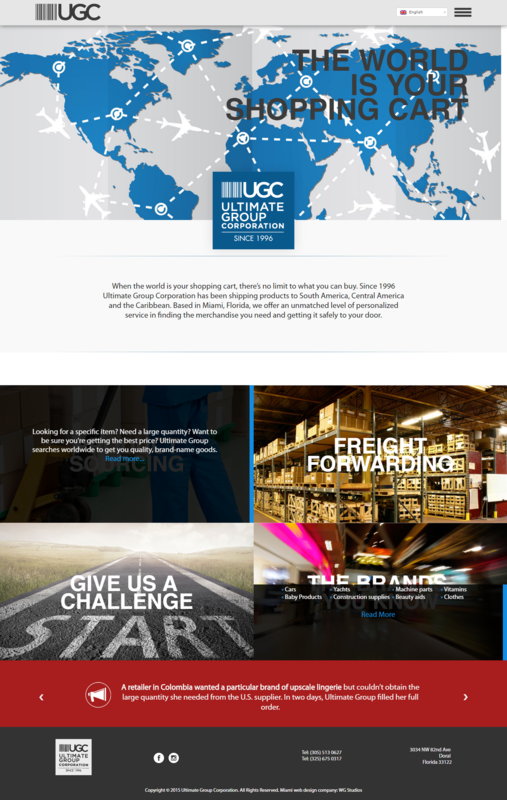 With a desire to further grow the business and expand into additional countries, the president of Ultimate Group Corporation, Paolo Ramirez, decided it finally needed a website. The company hired WG Studios, a well-established web design firm in Miami, Florida. They in turn brought in Susan Greene to be the copywriter for the project. Susan Greene spoke with Paolo to learn about the business and determine the best way to present its extensive capabilities. The result was a website approximately 10 pages long that explained why Ultimate Group Corporation should be the first call for companies in South and Central America seeking to purchase consumer goods. The website not only became a vehicle for attracting new business. It also was effective in making existing customers aware of the full range of the company’s services. Almost as soon as it was launched, the site gained online visibility and became an effective marketing tool, helping Ultimate Group Corporation to accelerate the growth of what was already a well-established company. I'm in love with the content for our new website. I agree with everything you wrote. You are the best! Does your business need a website to promote your products and services? Or do you have an existing website that's ready for an upgrade? Let's talk about the exciting possibilities for marketing. Contact Susan Greene today!